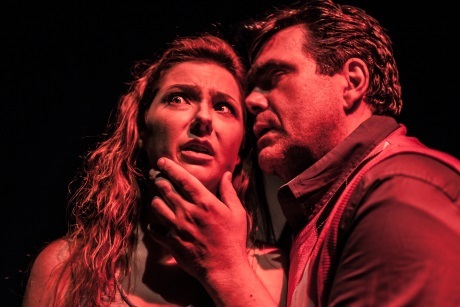 The Molotov Theatre group is devoted to plays in the Grand Guignol style, which basically means melodramatic (but non-supernatural) horror stories. If this is to your taste, their current production is well worth catching. In it a bunch of teenagers are obsessed with a video game about zombies in their neighborhood. It is a nightmare story, with dollops of humor, of dark human imaginings seeping into real life. Playwright Jennifer Haley presents us with a set of fathers (all played by Molotov co-founder Alex Zavistovich), mothers (all played by Annette Mooney Wasno), daughters (all played by Jen Bevan), and sons (all played by Yoni Gray). There is even a personification of the video game walkthroughs (Brian Kraemer) Some of the characters catch on at least to some extent of what is happening while others are oblivious. The spare set–a black box theatre with white rectangular boxes serving as scenery–provides an abstract contrast to the strong emotions on display and the looming violence. Notable are the performances of Miss Bevan and Mr. Gray who provide credible depictions of adolescents. The dramatic tension doesn’t come from the relationship of the game to reality; that becomes clear fairly early on. The tension arises, rather, in how it will all work out. Will the normal, everyday world somehow reassert itself against the video game’s zombie universe? Will natural relationships (none of them in a particularly healthy state) strengthen themselves and be able to withstand the war against the zombies? This is exemplified by one of the obsessive gamers who insists on calling his mother–much to her annoyance– by her first name, thus seeming to deny or distort or at least trivialize the the meaning, of his identity as a son. As sometimes happens, a work essentially of popular entertainment winds up pointing to deeper cultural currents. Neighborhood 3: Requisition of Doom is playing through August 2, 2015 at the DC Arts Center in Washington, DC.